Learning the game of tennis isn’t easy. Fortunately, there is some great tennis training equipment on the market to make it easier. 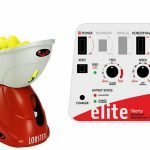 We’ve looked at a huge number of tennis training devices over the years and have come up with a list of ten that can be really useful in upping your game. I want to go through each device in detail. I selected these tennis training devices because they help a wide range of issues on the court. These include serves, volleys, groundstrokes, grips, and footwork. While you may not need all of them, some may prove invaluable to improving your game. If you have a child who’s learning, these tools are indispensable. And if you’re a coach like me, you can really fast-track your students’ success. The main product images all link to Amazon.com where you can see the current pricing (affiliate links to Amazon for the exact model I’m reviewing here). Now, I use all 10 training devices in my practice, so I endorse them all. However, every training tool has a drawback or two, and I’ll discuss those as well. I want to be perfectly candid with you so you know all the facts before purchasing. Alright, let’s get into it! What It Does – Helps you learn topspin easily. It teaches you the correct racket angle to approach the ball. Who It’s For – Beginner and Intermediate players. How It Can Help You – Will improve your tennis strokes by adding topspin, which keeps the ball in the court. This is essential for getting to the higher levels of tennis. Why It’s Important – All great players hit with topspin. Most beginner and club players lack topspin or enough of it. This training device will teach you to consistently hit with topspin without learning complicated techniques. My Review – The Topspin Pro is fantastic training device for beginner players. I find intermediate players can benefit, but it works really well with kids and players with little or no experience. Teaching or learning the concept of topspin can be challenging. Players are taught to brush on the ball but don’t notice if it spins or not. I like the Topspin Pro because the player gets instant feedback. He or she can see if the ball is spinning forward or not. Most people think of this device for groundstrokes only. But it can be used for the slice serve, topspin serve, and slice backhand. The device is adjustable and I found it can be used for any height person. This device is quite durable and you can hit the heck out of it with no problems. The main drawback to the Topspin Pro is its size. It does retract down, but when I go to the court, it’s just another bulky thing to bring along. If you have a court where you can leave the Topspin Pro up, that would be ideal. Or, you could leave it set up at home and just practice in your house. 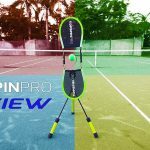 I find that you get better results using the Topspin Pro for 5-10 minutes a day over many days, rather than using it for a long period of time once in a while. If you’re a coach, you can have your students use it for 5-10 minutes before practice – doing 5 minutes of backhands and 5 minutes of forehands. The only other drawback of this device is that after hitting on it for 10 minutes, it gets a little monotonous. That’s why I recommend using it 5-10 minutes a day every time you practice. Overall, this is a great training aid for learning and teaching topspin. What It Does – Improves agility on the court and good for learning various footwork patterns in tennis. Who It’s For – Any skill level or age. But probably best for kids and junior players. How It Can Help You – The rings will ingrain proper footwork position into memory. However, you need to know what you’re doing. If you do know, this will translate into more powerful and efficient groundstrokes. Why It’s Important – Footwork is everything at the higher levels of tennis. I can’t think of a better training aid to help learn correct footwork. The rings are very simple, but very effective. My Review – I first saw these rings used in a tennis training video for footwork on youtube. When I saw how effective they were, I had to order them. I got them from Amazon and they’ve been indispensable to teaching my junior players advanced level footwork since. Keep in mind, the rings are only tools. You need to know footwork patterns to benefit from them. I also use them myself and find they work perfectly. Six rings come in a set. Each set comes with three different colors: green, yellow, and red. I find one set can easily be used with 2-3 children. The sets are available in either a 15” diameter or a 21” diameter. I use the 15” diameter, since most of my students are aged 6-12. They work fine for me as well. The rings are nonslip, so they stay on the ground, even when hit a bit. This is seriously a great training tool for footwork, as it teaches players the proper spot to place their feet. I can’t really see any drawback to the rings, except that you’ll need to know footwork patterns to use them. What It Does – Teaches you exactly where to toss and hit the serve. Who It’s For – Beginners and children. Also beneficial for intermediate players having trouble with their serve and overheads. How It Can Help You – Will provide a strong visual cue so you know the exact place you should be tossing and striking the ball on the serve. This is very important for tennis beginners of all ages. Why It’s Important – The serve is an essential stroke in tennis. If a you can’t toss in the ideal location to hit the ball, the serve will not work. This tool corrects that issue. The Tennis Serve Doctor is also helpful for learning overheads. My Review – Overall, I like this product and feel it brings a lot of value to children and complete newbies. I teach a lot of children and many of them have poor tosses, not allowing them to hit the ball on the serve. I find this tennis device to be a great training aid for the serve. I have the children set up in the correct serving stance, go through their serve motion, and strike the ball. The pole is adjustable to any height, so I can hold the pole in the perfect hitting zone for each student. This allows the kids to practice their serve motion, actually strike the ball in the perfect spot, and finish inside the baseline. I use the Tennis Serve Doctor with the kids for a few minutes, having them hit about 15-20 serves. I then hand them a ball and have them toss and serve on their own. After hitting with the Tennis Serve Doctor, they have a much better perception of the ideal place they need to hit the ball and usually end up tossing better. While this is a very simple device, it’s still quite effective. The main drawback of this tennis tool is you need someone to hold the pole for you. And it can be quite tiring holding it for long periods of time. But it’s a great training tool, especially if you’re teaching a child. Besides the serve, you can also use the Serve Doctor for improving groundstrokes. What It Does – Places your wrist in the correct 90-degree position to hit powerful and “effortless” groundstrokes and volleys. Who It’s For – Beginner and intermediate players of any age. How It Can Help You – The device allows you to feel the proper way to swing – like the pros. Trains the muscles in your wrist to remain in the 90-degree position, which will dramatically improve your shots. Why It’s Important – All professional players hit with or close to a 90-degree position in the wrist at contact. If you do not achieve this position, you’ll never maximize your potential on groundstrokes and volleys. My Review – For the price, this device is worth its weight in gold if it works for you. I’ve suggested it to some of my students (I teach tennis) and it helped them feel the correct way to swing. It’s a tennis training device that works well in practices. You really couldn’t use it to play a match, because you can’t serve or hit slices with it. But for practicing your forehand, backhand, and volleys it’s great. I read a few reviews on Amazon and some people complained that the Tennis Swing Wrist Training Aid either slipped off while hitting or did not fit. I didn’t find this to be the case with my students. Overall, I would recommend trying this training aid out if you or you’re child/students are having difficulty maintaining the 90-degree laid-back wrist position. What It Does – Provides weighted resistance on the racket. Who It’s For – Any age and any level. How It Can Help You – Develops strength, racket speed, and endurance. Why It’s Important – This training aid will increase your racket speed by making it feel lighter when you remove the weighted resistance. Faster racket speed equates to more spin and power on all your shots. 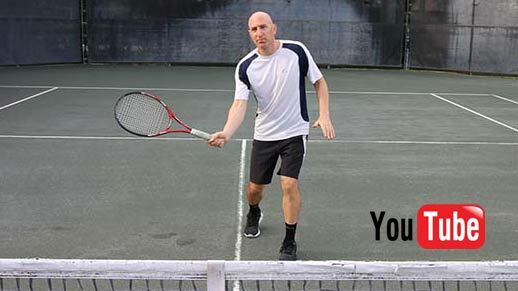 My Review – I carry this resistance tool in my tennis bag to every practice session and match. I find it’s a great way to warm up my swings and increase my racket speed. I practice forehands, backhands, and serves with the weights on my racket. 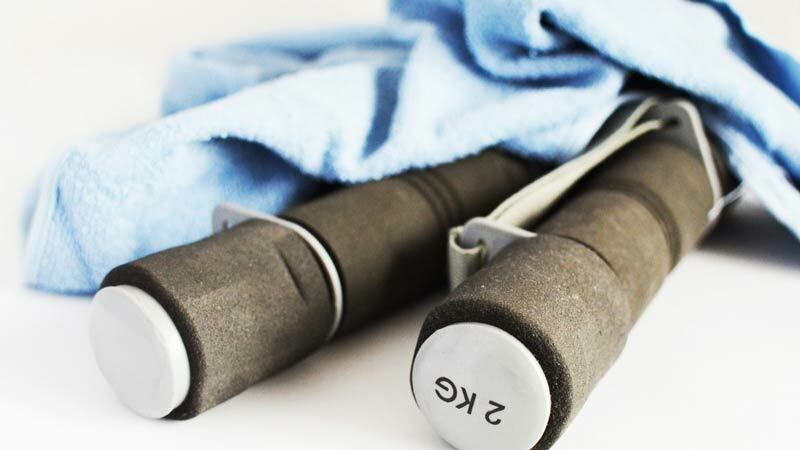 In the past, I used a small dumbbell tied to a racket I didn’t use. I always feared the dumbbell would fly off. So when I was that Tennis Power Trainer made this product, it was a no-brainer to order it. This item comes with a racket weighted “vest” that slips over the head of the racket. You can take practice swings with it. It also comes with a weight that you can put in the throat of the racket. The weight in the throat of the racket will supposedly allow you to hit with the extra weight. I find it to be too heavy and cumbersome to effectively hit with. So I just use both as a weighted resistance on practice swings. Both myself and my students feel the racket is noticeably lighter after removing the racket training weight. Of course, the feeling doesn’t last long – maybe 10 minutes. I typically keep the racket weight on one racket and swing it between games or during breaks. The resistance stays on the racket with no problem, so you can feel safe swinging as fast you want. It also goes on and comes off easily as well. If you’re looking to increase your racket speed, at least temporarily, there is no product better to do it. I highly recommend this one for serious tennis enthusiasts. What It Does – Teaches proper grip and hand placement on the racket. Who It’s For – Beginners of any age. How It Can Help You – Maintains the hand position in the proper grip for any stroke. Beginners tend to move their hands on the grip. This ensures the hand will stay in the chosen grip. Why It’s Important – Using the correct grip to hit certain shots, like the serve, forehand, backhand, and volley is essential in tennis. This device trains the beginner to keep their hands in the correct position. Also teaches what it feels like to use a particular grip. My Review – I like this product for beginners. It’s only made for teaching grip, which some beginners have difficulty with. Back when I was learning to serve with the continental grip, I use to shift back into the eastern forehand grip unconsciously. My coach noticed I did it, but I was completely unaware. This device would have saved me from changing my grip. Most beginners change their grip because they don’t trust that the strings will align to hit the ball. You can use this tennis grip tool to train such grips as the eastern backhand, eastern forehand, continental, semi-western forehand, and on and on. The training aid goes on any racket grip and is easy to put on and off. If you’re a beginner who is having trouble hitting with the proper grip, this is a great tool to have for a fairly low price. I find it very helpful for beginner kids as well. Perhaps the only drawback is that some people find it uncomfortable when hitting. But this training tool is only meant to be an aid. Once the grip is learned, it can be removed. What It Does – Improves speed, agility, coordination, and explosiveness. Who It’s For – Ages 8 to adult can benefit. Older players may not have the energy or joint fitness to jump around. How It Can Help You – This set contains all that you need to improve your balance, stamina, and footwork. This will translate into a higher level of play on the court. Why It’s Important – Footwork and explosive, quick moves are everything in tennis. This speed and agility training set is all you need to improve those attributes. My Review – I’ve purchased several agility ladders on Amazon and wasn’t happy with any of them until buying from this company.They make quality, durable products, which is why the price is a little higher than comparable, cheaper sets. In this one, you get several distinct training items: agility ladder, hurdles, a jump rope and space markers. I found from experience, I’d much rather spend $10-$20 extra and own a set that I enjoy using and lasts for the long term. Now that’s clear, we can talk about this training set and why it’s important. If you’re an aspiring junior player or young adult who is an avid tennis player, you should absolutely be using a set like this – at least twice a week, if not three. I selected this set because it contains the agility ladder (super important for footwork), the hurdles (excellent for teaching the split step and other footwork cues), and the space markers (great for marking out placements on the court). You, or your child/student, can use the agility ladder to practice an infinite number of footwork drills. Just look on youtube or check out the article I wrote on the agility ladder here. Athletes in almost every sport use the agility ladder, and tennis players are no different. Fast feet are essential at the higher levels. The hurdles are great too, with six all together in the set. They can be adjusted from 6-12 inches in height as well. If you’re serious about tennis, or a coach, I recommend the use of just three products for your footwork training: this speed and agility training set, the Tennis Donut Rings Set of 6, and a good jump rope. That’s really all you need for conditioning, speed, and explosiveness. Remember, footwork is everything in tennis. You should be trying to improve footwork just as much as your tennis strokes. This set will help you do it. What It Does – Helps improve the tennis serve, groundstrokes, and overheads. Who It’s For – Any age (6+) and skill level. Beginners and intermediate players will get the most benefit. How It Can Help You – Teaches you the correct tennis swing path using natural biomechanics. Teaches the continental grip along with pronation. 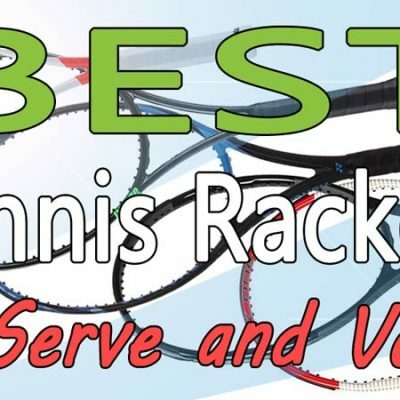 Will improve your serve, overheads, and groundstrokes. 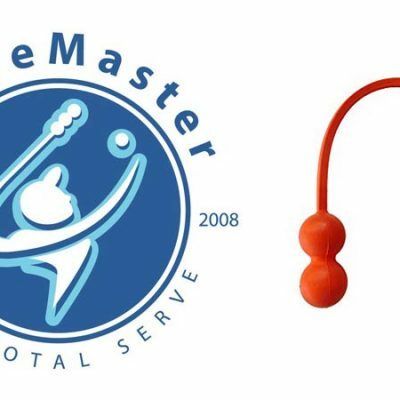 Why It’s Important – No other training device I know is more effective at teaching the serve than the ServeMaster. It can bring players up to speed on the serve faster than any other tool or technique I’ve seen or experienced. 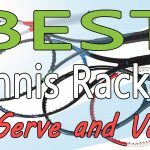 My Review – I started using this tennis serving tool a couple of years ago after seeing it on youtube. I had to try it for myself and for my students. At first, I was put off by the $50 price point (varies depending on which ServeMaster you purchase) for a long piece of rubber. But after using it with my students, I quickly became a believer. I can take kids who’ve never served before, and with the help of the ServeMaster, have them hit serves with fundamentally correct technique in less than 10-15 minutes. I love this product so much, I wrote an entire blog post on it and made a youtube video as well. In fact, many of my young students’ serves look better than some club level adults who’ve been playing for several decades! And this is all in one lesson. However, for the serve motion to be ingrained, a lot of practice is required. I’ll typically have my student use the ServeMaster before practicing their real serves. It always makes their motions better. Amazingly, it teaches the kids the racket drop, pronation, and the continental grip all at once. Simply amazing. For an accurate and effective swing you can’t go wrong with this serving device. You can purchase it with either one, two, or three balls attached to the end. 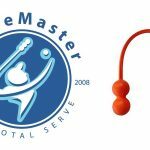 The two-ball ServeMaster is what I use and recommend. The one-ball is good for smaller children and the three-ball for strong adults. 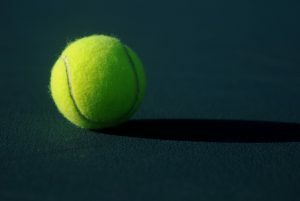 What It Does – Launches balls at you to practice all of your tennis strokes, with the exception of the serve. Who It’s For – Any age and any skill level will benefit. How It Can Help You – Provides you endless hours of practice. You can use the machine to learn and fine-tune any tennis stroke except the serve. This is one of the best training tools for helping improve your game, period. It also doesn’t require anyone else for you to practice. The machine does it all. Why It’s Important – The Lobster Elite Liberty feeds you balls in the exact location, with the exact spin, and the exact velocity you want. This allows you to fully concentrate on your strokes with no outside distractions. 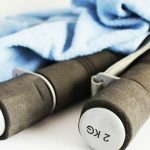 It’s really invaluable for improving your technique and will definitely increase your conditioning as well. My Review – I love this ball machine so much, I bought one for myself despite the hefty price tag. However, the price is a bargain compared to other similar ball machines on the market. I’ve had the Lobster Elite Liberty for two years now and never once had an issue with it. Like the ServeMaster, I wrote a long blog post reviewing it and also have a youtube video on it. I won’t go into extreme detail here, since I already covered it in other posts and videos. If you’re really interested in a ball machine, you should check out my blog post and video on it. Believe me, if I’m going to spend a grand on a ball machine, it’s going to be the best one on the market for the price. The Elite Liberty will do everything you need. The more expensive models are unnecessary. If you have the money and are looking for a ball machine, do yourself a favor and buy this one. You’ll love it. I use the Elite Liberty to practice all my strokes. You’re only limited by your imagination with how much you can do with it. It also oscillates from side-to-side, so you can practice your footwork too. The only drawback to this machine is the price. Not that it’s expensive for what it’s worth, but if you don’t have the cash to spend, then there aren’t a lot of better options. What It Does – Increases speed and agility by building hit strength and explosiveness. Perhaps just as important it trains the athlete to keep a lower center of gravity. Who It’s For – Any age and skill level will benefit. But juniors and young adults are probably best suited for the rigorous training of this tool. How It Can Help You – Teaches you to bend your knees and creates resistance in the legs so they build strength and speed. Will definitely improve lateral footwork on the court. Why It’s Important – As I’ve said previously, footwork and explosive movements are everything in tennis. This training tool is perfect for working on those attributes. My Review – I really like this product for improving lateral movement. It will also improve sprint speed, which is important for quick bursts on the court. While the agility ladder, hurdles, and rings I mentioned earlier are great for footwork, they don’t build speed exactly like the Kbands will. These resistance bands are being worn by all types of athletes now. Movement for tennis players is just as important as any other sport. And lateral movement is key. I use these bands myself and find they are comfortable enough and really do work. I can feel my legs burning after wearing them for a while. I have some of my advanced students wear them. It’s difficult to tell if they work on other people, but for my own body, I definitely notice a slight difference in quickness. One thing they’re supposed to do is help you get lower going from side-to-side, which is ultra-important in tennis. I like to wear the Kbands leg resistance bands when hitting. When I take them off, I feel faster. I notice that if you wear them a lot, they really do build up your leg strength and conditioning, allowing you to move faster on the court. For that reason, I have this product listed at number 10 on my list. Kbands the company, makes a lot of cool training gear. However, I chose these exact bands because they’re all you need to improve your explosiveness. The other sets and tools are overkill in my opinion. For the price, this is an excellent tool for improving footwork and speed.